Lately I've been getting several emails asking if you can be plant-based (vegan) if you can't have grains. The short answer is yes. You don't *have* to eat grains, but they are certainly a healthy option if you can include them. One of my meal plan clients can't have grains, and her easy solution is to put everything over potatoes or lentils instead of rice, or whatever grain the recipe might call for. Another option is to make "rice" from cauliflower. To make cauliflower rice you'll need one head of cauliflower. Remove leaves from the bottom, cut the cauliflower in half and then cut the florets off from the core. Discard the core and break up the florets into even sized pieces. Place florets in food processor (or you can even use a hand grater) in batches and process until evenly chopped. Remove rice to a large bowl and continue processing florets in batches until all florets are "riced". 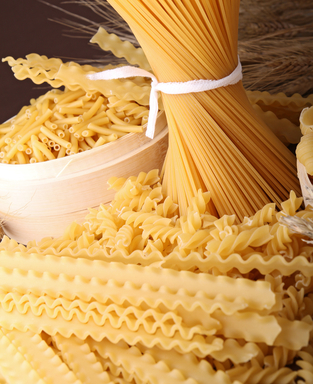 You can find non-grain pastas such as corn-based pasta, quinoa pasta, and soy pasta. You can also use miracle noodles (for more info on them, see this post). Spaghetti squash is another option as well as noodles made from zucchini using a spirooli. Blanched or raw cabbage sliced thinly can also work. 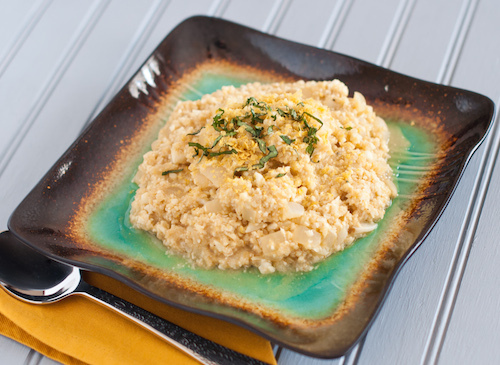 Since quinoa isn't technically a grain (it's a pseudo cereal) it might be an option for you. Quinoa is wonderfully universal and healthy. Quinoa flakes are a common replacement for oats. Flours get a little tricky. Some gluten-free flours like chickpea flour are grain-free, but many other gluten-free flours come from gluten-free grains like rice flour. Coconut flour could be another option, along with amaranth flour or almond flour. However, baking with these flours can sometimes be a little tricky. For more info on gluten-free baking, see this post. Note: These flours are pretty specialty, so you'll probably need to shop online or at a large health food store. Admittedly I've never used, eaten or worked with these flours (except chickpea flour--love that stuff!) or used quinoa flakes, so I can't vouch for how well they work as a substitute, but given their popularity in GF circles, I'm pretty confident. Finally, vegans who follow a raw diet tend to be grain-free (though sometimes they eat raw, soaked grains), so their websites and cookbooks can be an additional source of information and options. Allergies and dietary restrictions require a little creativity and extra patience, but it's entirely possible to live and thrive on a plant-based diet, no matter what you're dealing with.